Many different options available, fixed or fully functional louvers, manual or motorized louvers control, bi-fold, sliding or sliding stacking options, bi-fold or sliding can be operated manually or optional motorized system. Materials available to fabricate aluminum, exterior grade wood such as Teak, mahogany, IPE and similar exterior grade wood species. Different louver sizes are available along with custom made louvers and rails according to customer request.. Exterior shutters about 12' tall with 90PSF wind loads resistance. No support bar required, installed over curved wall, shutters are trapezoid in order to fit to curved opening. Custom made according to window shape and customer's request. Custom made to fit to the arched windows. Custom made to fit to the arched window. Custom made octagon window shutters to fit to octagon shape window. Custom made to fit round, oval shape window. 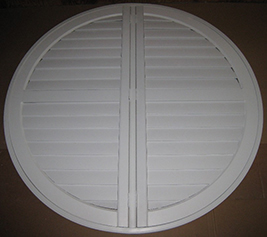 Round window shutters. Shutters slide open to sides ( over the wall) for uninterrupted view. Louvers operates and shutters slide for maximum flexibility. Custom made wood shutters to match and fit. 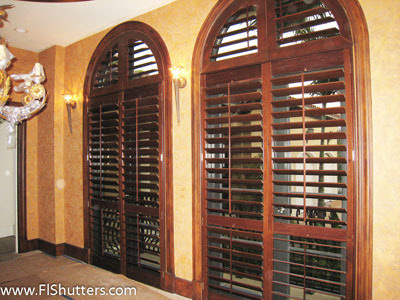 We build one of the strongest roll-up hurricane shutters. Design and made to handle Cat 5 hurricane. Manual or motorized or motorized with manual override in case power or motor issues. Our motorized shutters can be control by switch, by remote, with additional hardware by z-wave, by any smart-phone or computer, by home automation. Provides rain, sun, hurricane protection and security. Our custom made motorized and manual control roll up shutters can be installed to Vehicles, vessels, oil platforms and many others… Shutters can be operated while the vehicles or vessels moving. Custom made roll up shutters. Roll down shutters are grate for Tiki bars also. Provides security, hurricane protection, rain protection and more. Solar screen and Roll-up shutters work independent from each other, either one or both can be used as it required. Roll-up hurricane shutters makes this outdoor pool indoor on demand, other than hurricane protection and security roll-up shutters also provides shading, rain protection, turns outdoor to indoor and more. Up to 24' width without any middle support. Provides indoor room on demand , great for lanai, porch, restaurant, bar or any other business with out door sting area. Manual or motorized. 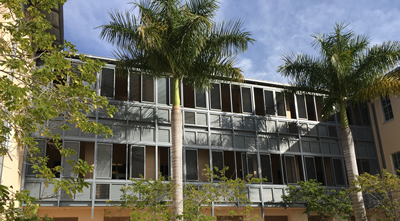 We custom make exterior screen/shades with guided track and with stainless steel cable/rod guided system. Our motorized exterior shades can be controlled by remote control, wall switch and optional Z-wave motor control, system can be controlled anywhere in the world by smart-phone, iPad, and by any computer. 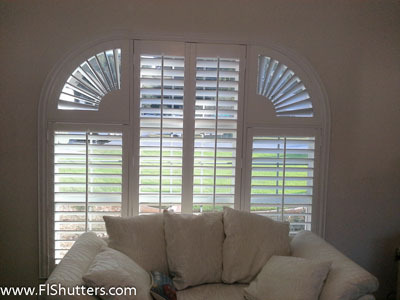 Roll up shutters over arched windows. Exterior hurricane roll up shutters installed on lanai. Exterior hurricane roll up shutters installed on lanai. Tracks are invisible which were installed inside the round column .